This image comes from a very deep Chandra observation of the Tycho supernova remnant, produced by the explosion of a white dwarf star in our Galaxy. 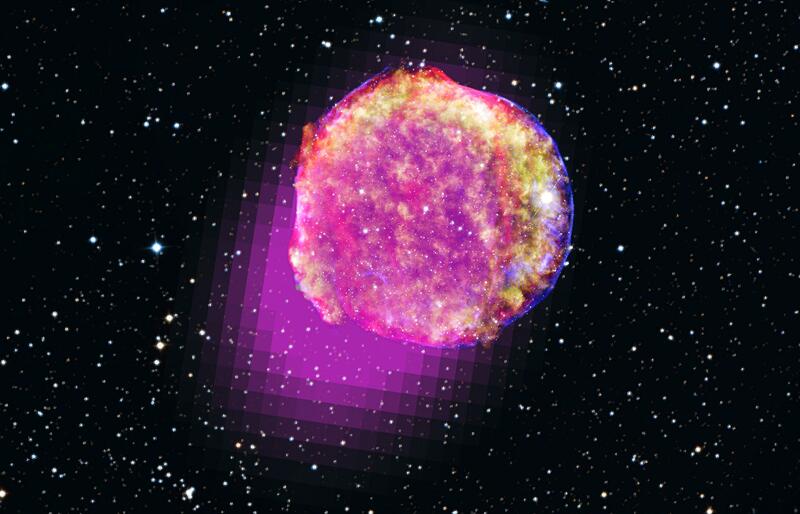 Low-energy X-rays (red) in the image show expanding debris from the supernova explosion and high energy X-rays (blue) show the blast wave, a shell of extremely energetic electrons. These high-energy X-rays show a pattern of X-ray "stripes" never previously seen in a supernova remnant. By rolling the mouse over the color image [right], two regions containing stripes in the high energy image can be seen superimposed on the full color version. Some of the brightest stripes can also directly be seen in the full color image, on the right side of the remnant pointing from the outer rim to the interior. The stellar background is from the Digitized Sky Survey and only shows stars outside the remnant. These stripes may provide the first direct evidence that supernova remnants can accelerate particles to energies a hundred times higher than achieved by the most powerful particle accelerator on Earth, the Large Hadron Collider. The results could explain how some of the extremely energetic particles bombarding the Earth, called cosmic rays, are produced, and they provide support for a theory about how magnetic fields can be dramatically amplified in such blast waves. The Tycho supernova remnant is named for the famous Danish astronomer Tycho Brahe, who reported observing the supernova in 1572. It is located in the Milky Way, about 13,000 light years from Earth. Because of its proximity and intrinsic brightness, the supernova was so bright that it could be seen during the daytime with the naked eye. The discovery of a pattern of X-ray “stripes” in the remains of an exploded star may provide the first direct evidence that a cosmic event can accelerate particles to energies a hundred times higher than achieved by the most powerful particle accelerator on Earth. 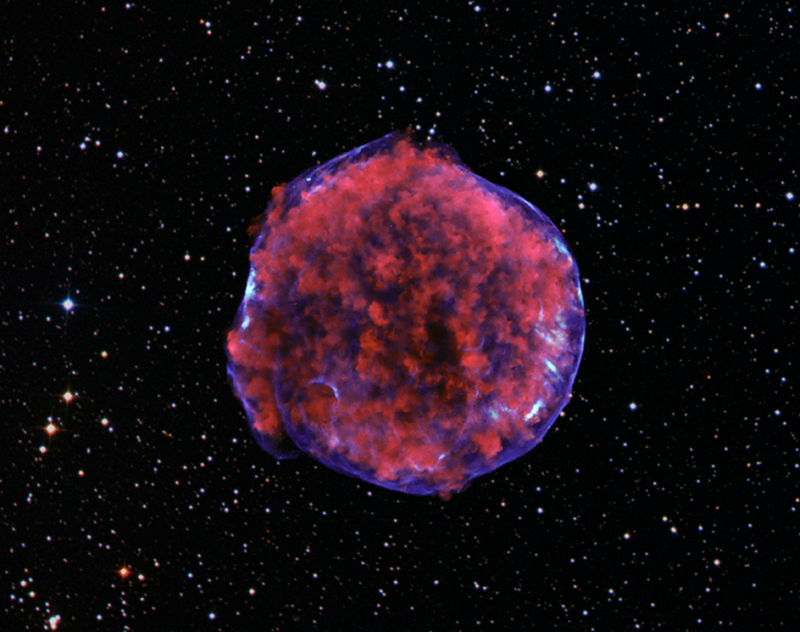 This result comes from a very long observation of the Tycho supernova remnant with NASA's Chandra X-ray Observatory. It could explain how some of the extremely energetic particles bombarding the Earth, called cosmic rays, are produced. "We've seen lots of intriguing structures in supernova remnants, but we've never seen stripes before," said Kristoffer Eriksen, a postdoctoral researcher at Rutgers University who led the study. "This made us think very hard about what's happening in the blast wave of this powerful explosion." This latest study from Chandra provides support for a theory about how magnetic fields can be dramatically amplified in such blast waves. In this theory, the magnetic fields become highly tangled and the motions of the particles very turbulent near the expanding supernova shock wave at the front edge of the supernova remnant. High-energy charged particles can bounce back and forth across the shock wave repeatedly, gaining energy with each crossing. Theoretical models of the motion of the most energetic particles -- which are mostly protons -- are predicted to leave a messy network of holes and dense walls corresponding to weak and strong regions of magnetic fields, respectively. The X-ray stripes discovered by the Chandra researchers are thought to be regions where the turbulence is greater and the magnetic fields more tangled than surrounding areas, and may be the walls predicted by the theory. Electrons become trapped in these regions and emit X-rays as they spiral around the magnetic field lines. However, the regular and almost periodic pattern of the X-ray stripes was not predicted by the theory. "It was a big surprise to find such a neatly arranged set of stripes," said co-author Jack Hughes, professor of physics and astronomy at Rutgers. "We were not expecting so much order to appear in so much chaos. It could mean that the theory is incomplete, or that there's something else we don't understand." Assuming that the spacing between the X-ray stripes corresponds to the radius of the spiraling motion of the highest energy protons in the supernova remnant, the spacing corresponds to energies about 100 times higher than reached in the Large Hadron Collider. These energies equal the highest energies of cosmic rays thought to be produced in our Galaxy. Because cosmic rays are composed of charged particles, like protons and electrons, their direction of motion changes when they encounter magnetic fields throughout the galaxy. So, the origin of individual cosmic rays detected on Earth cannot be determined. Supernova remnants have long been considered a good candidate for producing the most energetic cosmic rays in our Galaxy. The protons can reach energies that are hundreds of times higher than the highest energy electrons, but since they do not radiate efficiently like the electrons, direct evidence for the acceleration of cosmic ray protons in supernova remnants has been lacking. These results also support the prediction that magnetic fields in interstellar space are greatly amplified in supernova remnants, but the difference between the observed and predicted structures means that other interpretations cannot be ruled out. "We were excited to discover these stripes because they might allow us to directly track, for the first time, the origin of the most energetic particles produced in our galaxy," said Eriksen. "But, we're not claiming victory yet." The Tycho supernova remnant is named for the famous Danish astronomer Tycho Brahe, who reported observing the supernova in 1572. Scientists think the explosion occurred when a white dwarf star grew in mass and exceeded its weight limit, forming a so-called Type Ia supernova. The Tycho remnant is located in the Milky Way, about 13,000 light years from Earth. "Supernova remnants are our best cosmic laboratories for understanding how nature accelerates the highest energy cosmic rays," said Roger Blandford of Stanford University, a noted expert in this field who was not involved with these findings. "These careful measurements provide a very strong clue as to what actually happens at these giant shock fronts." Under gaze of human eyes? Named for one called Tycho Brahe. Acts like the Simpson known as Bart. 'Tis to MADness he aspires! Still he slips the Owl's sharp clasp! Was Art there to smile at thee? Did frame thy remnant from afar? Yes, yes, I'm going to my room this instant...! "O crassa ingenia. O caecos coeli spectatores"
("Oh thick wits. Oh blind watchers of the sky"). Tycho's discovery was the inspiration for Edgar Allan Poe's poem, "Al Aaraaf". In 1998, Sky & Telescope magazine published an article by Donald W. Olson, Marilynn S. Olson and Russell L. Doescher arguing, in part, that Tycho's supernova was also the same "star that's westward from the pole" in Shakespeare's Hamlet. <<"Al Aaraaf" is an early poem by American writer Edgar Allan Poe. At 422 lines, it is the longest poem Poe wrote and was inspired by Tycho Brahe's discovery of a supernova back in 1572 which was visible for about 17 months and was believed to foretell disaster or that humanity would be punished for breaking God's laws. Poe may have gotten the idea to base a poem on Brahe's astronomical discovery from poet John Keats's use of the 1781 discovery of the planet Uranus in a poem called "On First Looking into Chapman's Homer" (1816). Poe identified Tycho's nova with Al Aaraaf, a star that was the place between paradise and hell. Al-A`raaf (Arabic الأعراف) was a place where people who have been neither markedly good nor markedly bad had to stay until forgiven by God and let into Paradise, as discussed in Sura 7 of the Qur'an. The name of the star has been changed from "Al Orf" to "Al Aaraaf" to become similar to the word arafa, which means distinguishing between things. "Al Aaraaf", which Poe claimed to have written before he was 15, was first published as the major poem in Poe's 1829 collection Al Aaraaf, Tamerlane, and Minor Poems. The book and "Al Aaraaf" in particular received mostly negative reviews for its complexity, obscure references, and odd structure. The negative response to "Al Aaraaf" may have inspired Poe's later poetic theory that poems should be kept short. Years later, in 1845, Poe used "Al Aaraaf" to hoax members of the Boston literary circle during a reading. Poe claimed the poem was a new one and his audience was perplexed by it. He later claimed a Boston crowd did not deserve a new poem. He held a strong dislike for New England poets and the New England-based Transcendental movement and hoped by presenting a poem he had written in his youth would prove Bostonians did not know good literature. 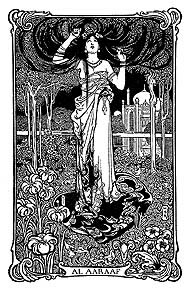 In the opening section of the poem, God commands Nesace, a name for Beauty's spirit, to convey a message to "other worlds". Nesace rouses the angel Ligeia and tells her to awaken the other thousand seraphs to perform God's work. Two souls, however, fail to respond: the "maiden-angel" Ianthe and her "seraph-lover" Angelo (Michelangelo), who describes his death on earth and the flight of his spirit to Al Aaraaf. Ianthe and Angelo are lovers, and their failure to do as Nesace commanded results in God not allowing them into heaven. 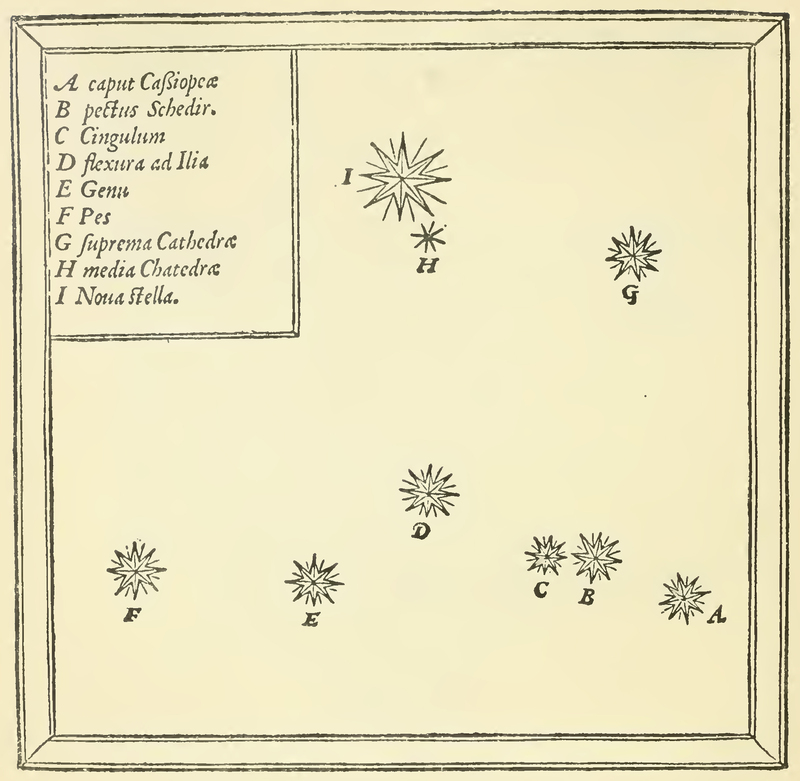 In early November 1572, observers on Earth witnessed the appearance of a "new star" in the constellation Cassiopeia, an event now recognized as the brightest naked-eye supernova in more than 400 years. It's often called "Tycho's supernova" after the great Danish astronomer Tycho Brahe, who gained renown for his extensive study of the object. Now, years of data collected by NASA's Fermi Gamma-Ray Space Telescope reveal that the shattered star's remains shine in high-energy gamma rays. The detection gives astronomers another clue in understanding the origin of cosmic rays, subatomic particles -- mainly protons -- that move through space at nearly the speed of light. Exactly where and how these particles attain such incredible energies has been a long-standing mystery because charged particles speeding through the galaxy are easily deflected by interstellar magnetic fields. This makes it impossible to track cosmic rays back to their sources. "Fortunately, high-energy gamma rays are produced when cosmic rays strike interstellar gas and starlight. These gamma rays come to Fermi straight from their sources," said Francesco Giordano at the University of Bari and the National Institute of Nuclear Physics in Italy. He is the lead author of a paper describing the findings in the Dec. 7 edition of The Astrophysical Journal Letters. Better understanding the origins of cosmic rays is one of Fermi's key goals. Its Large Area Telescope (LAT) scans the entire sky every three hours, gradually building up an ever-deeper view of the gamma-ray sky. Because gamma rays are the most energetic and penetrating form of light, they serve as signposts for the particle acceleration that gives rise to cosmic rays. "This detection gives us another piece of evidence supporting the notion that supernova remnants can accelerate cosmic rays," said co-author Stefan Funk, an astrophysicist at the Kavli Institute for Particle Astrophysics and Cosmology (KIPAC), jointly located at SLAC National Accelerator Laboratory and Stanford University, Calif. In 1949, physicist Enrico Fermi -- the satellite's namesake -- suggested that the highest-energy cosmic rays were accelerated in the magnetic fields of interstellar gas clouds. In the decades that followed, astronomers showed that supernova remnants may be the galaxy's best candidate sites for this process. When a star explodes, it is transformed into a supernova remnant, a rapidly expanding shell of hot gas bounded by the blast's shockwave. Scientists expect that magnetic fields on either side of the shock front can trap particles between them in what amounts to a subatomic pingpong game. "A supernova remnant's magnetic fields are very weak relative to Earth's, but they extend across a vast region, ultimately spanning thousands of light-years. They have a major influence on the course of charged particles," said co-author Melitta Naumann-Godo at Paris Diderot University and the Atomic Energy Commission in Saclay, France, who led the study with Giordano. As they shuttle back and forth across the supernova shock, the charged particles gain energy with each traverse. Eventually they break out of their magnetic confinement, escaping the supernova remnant and freely roaming the galaxy. The LAT's ongoing sky survey provides additional evidence favoring this scenario. Many younger remnants, like Tycho's, tend to produce more high-energy gamma rays than older remnants. "The gamma-ray energies reflect the energies of the accelerated particles that produce them, and we expect more cosmic rays to be accelerated to higher energies in younger objects because the shockwaves and their tangled magnetic fields are stronger," Funk added. By contrast, older remnants with weaker shockwaves cannot retain the highest-energy particles, and the LAT does not detect gamma rays with corresponding energies. The supernova of 1572 was one of the great watersheds in the history of astronomy. The star blazed forth at a time when the starry sky was regarded as a fixed and unchanging part of the universe. Tycho's candid account of his own discovery of the strange star gives a sense of how radical an event it was. The supernova first appeared around Nov. 6, but poor weather kept it from Tycho until Nov. 11, when he noticed it during a walk before dinner. "When I had satisfied myself that no star of that kind had ever shone forth before, I was led into such perplexity by the unbelievability of the thing that I began to doubt the faith of my own eyes, and so, turning to the servants who were accompanying me, I asked them whether they too could see a certain extremely bright star…. They immediately replied with one voice that they saw it completely and that it was extremely bright," he recalled. The supernova remained visible for 15 months and exhibited no movement in the heavens, indicating that it was located far beyond the sun, moon and planets. Modern astronomers estimate that the remnant lies between 9,000 and 11,000 light-years away. Keith Bechtol, a KIPAC graduate student who is also based at SLAC, was one of the first researchers to notice the potential link. "We knew that Tycho's supernova remnant could be an important find for Fermi because this object has been so extensively studied in other parts of the electromagnetic spectrum. We thought it might be one of our best opportunities to identify a spectral signature indicating the presence of cosmic-ray protons," he said. The science team's model of the emission is based on LAT observations, along with higher-energy TeV (trillion electron volt) gamma rays mapped by ground-based facilities and radio and X-ray data. The researchers conclude that a process called pion production best explains the emission. First, a proton traveling close to the speed of light strikes a slower-moving proton. This interaction creates an unstable particle -- a pion -- with only 14 percent of the proton's mass. In just 10 millionths of a billionth of a second, the pion decays into a pair of gamma rays. If this interpretation is correct, then somewhere within the remnant, protons are being accelerated to near the speed of light, and then interacting with slower particles to produce gamma rays, the most extreme form of light. With such unbelievable goings-on in what's left of his "unbelievable" star, it's easy to imagine that Tycho Brahe himself might be pleased. <<Many thousands of years ago, far away in the constellation Cassiopeia, a white dwarf star blew up with cataclysmic violence. Much, much later, in the year 1572 when good Queen Bess was on the throne, the light of the supernova reached Earth. Now, astronomers probing the vast cloud of slowly cooling gases left behind say they have made a remarkable series of discoveries. In particular, it seems that in addition to the regular outward-bound shockwave created when the dwarf star blew up - which is moving outwards at around 300 times the speed of sound as it travels in those parts - a "reverse shockwave", caused when the expanding supernova wave crashed into the thin interstellar gases surrounding it, is also hurtling inwards at no less than Mach 1,000. This reflected implosion front is seemingly causing the remnant puff of galactic smoke left after the fireball to stay hot and emit X-rays, so enabling it still to be seen even though the light reaching us from the area was emitted more than 400 years after the explosion. (In actual fact the remnant itself is probably comparatively boring to look at close up, having blown up for real back in the era of the Pharaohs or earlier. It's often known as "Tycho's supernova" or similar here on Earth, however, after the sixteenth century golden-nosed Danish astronomer Tycho Brahe - one of the first to study it.) "We wouldn't be able to study ancient supernova remnants without a reverse shock to light them up," says Hiroya Yamaguchi of the Harvard-Smithsonian Center for Astrophysics. According to an announcement from the Center: The reverse shock wave heats gases inside the supernova remnant and causes them to fluoresce. The process is similar to what lights household fluorescent bulbs, except that the supernova remnant glows in X-rays rather than visible light. The reverse shock wave is what allows us to see supernova remnants and study them, hundreds of years after the supernova occurred. The team studied the X-ray spectrum of Tycho's supernova remnant with the Suzaku spacecraft. They found that electrons crossing the reverse shock wave are rapidly heated by a still-uncertain process. Their observations represent the first clear evidence for such efficient, "collisionless" electron heating at the reverse shock of Tycho's supernova remnant.